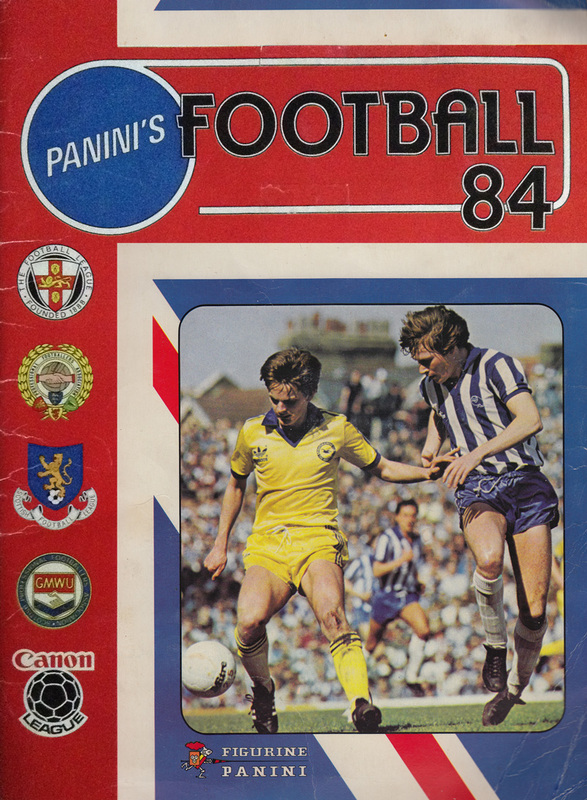 I’m sure it was at the forefront of the players’ minds that when they were relegated from the First Division at the end of the 1982/83 season, that they were also going down in the Panini sticker coverage for the following season. From the luxury of a double-page spread with individual stickers and profiles to having to share their crest on a halved sticker with another team (Cambridge United, in this case, who went a record 31 League games that season without a win! ), it certainly was a come-down. Still, at least the blow was softened by having Gary Howlett in action on the cover from the FA Cup semi-Final in April 1983. 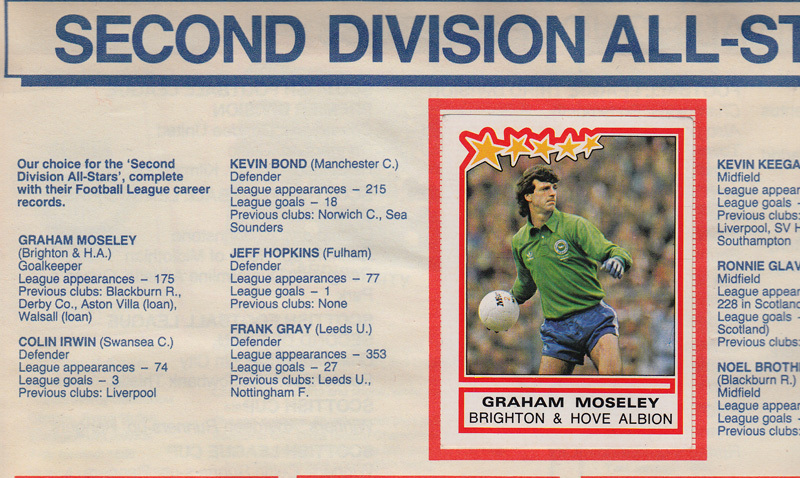 Also, in the Second Division All-Stars Team, Graham Moseley is selected as the best keeper of the second tier. 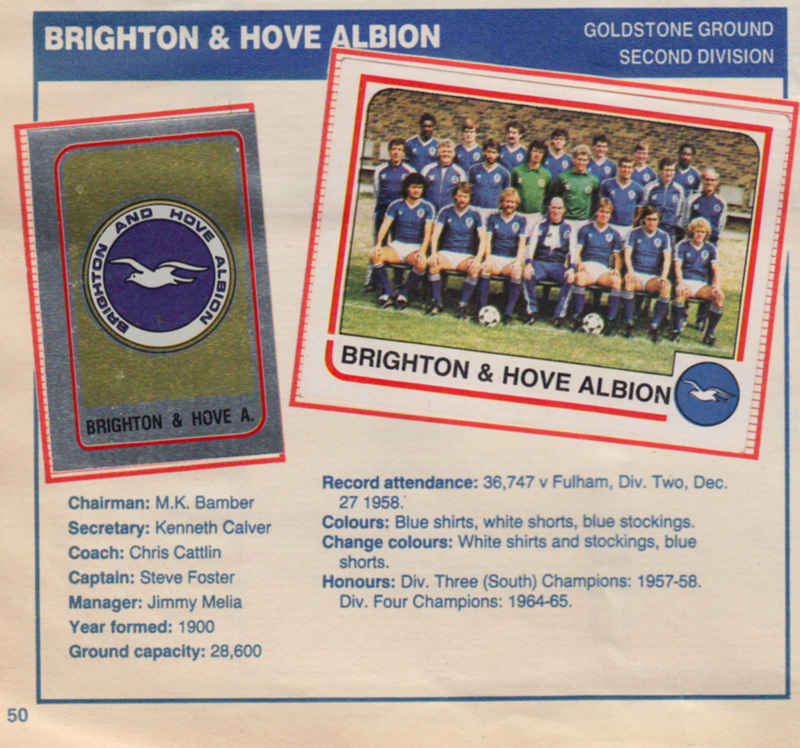 He actually only played one League game for Brighton during 1983/84, losing his place to veteran Joe Corrigan for most of it. Notable inclusions in this album are Tony Towner (Wolves) who finally made it into Division One, as well as Dennis Mortimer, Steve Jacobs, Mick Ferguson, Russell Osman, Mark Lawrenson, Michael Robinson, Brian Horton, Frank Stapleton, Willie Young, Mark Barham, Danny Wilson, Justin Fashanu, John Gregory, Frank Worthington, Ian Baird, Mark Chamberlain, Mickey Thomas, Gary Rowell, Gary O’Reilly, Gary Stevens and John Humphrey. Brighton striker Chris Rodon even manages to get into the Second Division Cardiff City team photo despite only being there on loan for six games.